Historically the Jewish state is said to be renowned for winning wars but losing the peace. So if, hopefully, this military operation in Gaza goes well, what type of peace should Israel sue for? In my estimation there is a continuum of post conflict solutions to the Gaza problem (all assuming a resounding defeat of Hamas), ranging from the reimposition of the Israeli civil administration in Gaza to some sort of international mandate to handing over control to Abu Mazen and the PA. I personally think the latter is the ideal but just don’t know how practical it is. Would the PA have the capacity to subdue the last remaining remnants of Hamas’ rag tag army? And even if so would they be prepared to do it? There would be a real risk that Fatah would be seen as Israeli puppets. The next best in my opinion is the international mandate. There has been some talk about European monitors at the Gaza border posts. But I think this is far too unambitious. The war with Hezbollah has set a precedent for UN troops to police former rocket launch sites and arms smuggling. I would like to see something much more substantial and much more Arab and Muslim in nature. I propose that a UN force together with some sort of international civil administration be imposed on the strip. They would need to clean up the last vestiges of Hamas and insure no more rockets are fired at Israeli civilians. 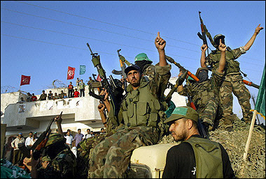 They would also need to provide some form of government in Gaza until Abbas is strong enough to take control. Countries like Egypt and Jordan would need to play a major role. The PA should also be included as a partner in this initiative. This option obviously has its downsides. 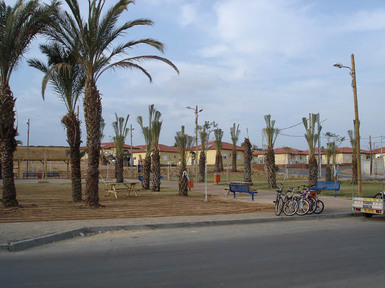 Which countries would be willing to send troops to police as unruly a place as Gaza? Also would they do an effective job? The results in Southern Lebanon have not been very promising. Hezbollah is said to have completely rearmed under UN noses. But I definitely think it is worth a shot. The last option of a return to Israeli military occupation would be horrendous. It seems unlikely that the people of Gaza would ever accept them as overlords. This would result in a perpetual rebellion in which many Israeli soldiers and Palestinians could potentially lose their lives. It would weaken the PA and dash all of hope of an independent Palestinian state. But having Israeli soldiers permanently on the ground would most likely stop the rockets. None of the post conflict options are easy. Prime Minister Olmert and Defense Minister Barak must have known this going in. Lets hope their peace planning has been effective as their military campaign (so far). All this death and destruction must not be in vein. I will be in Colombia on holiday for the next few weeks. Steve is also away. So expect blogging to be a bit slow. I will try update as much as I can. Please feel free to post relevant information or opinions in the comments. Despite intense pressure, the new ANC government has surprisingly remained relatively restrained in its condemnation of Israel over the last 3 days. President Kgalema Motlanthe and his political allies are not exactly renowned for their pro-Israel views. A few month ago he, signed a hate filled declaration accusing the Jewish state of every crime imaginable from Apartheid to genocide. However the ANC has publically remained committed to a 2 state solution and continued relations with Israel. But if the military operation escalates and the death toll rises, one wonders if they will maintain this position. Thus this latest Mid East war will provide the first real test for the durability of Israel South Africa ties under the new ANC administration. Almost as soon as the first Israeli planes stuck Gaza, South African trade union and ANC coalition partner COSATU called on President Motlanthe to ‘break diplomatic ties with Apartheid Israel and institute sanctions against it’ as a result of the Jewish state’s ‘criminal’ behaviour. They also implored South Africans to ‘intensify’ the boycott of Israeli goods. The usual South African anti-Israel gang also wasted no time jumping on the bandwagon. Former minister of Intelligence Ronnie Kasrils said he stood by his statement that Israeli security forces were 'babykillers'. 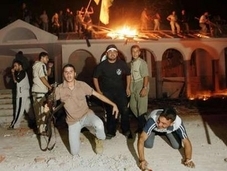 In addition he claimed that that the attacks and the siege against Gaza were proof of Israel's 'genocidal intentions'. He also condemned in his usual over the top style the 'complicity and silence of the west' throughout the period of the 'slow murder of the people of Gaza'. Of course UN appointed Gaza massacre PI Archbishop Emeritus Desmond Tutu could not hold back his anger. With his usual simplicity, he declared that the Israeli bombings bore ‘all the hallmarks of war crimes’. His logic is as follows: ‘in the context of total aerial supremacy, in which one side in a conflict deploys lethal aircraft against opponents with no means of defending themselves, the bombardment bears all the hallmarks of war crimes.’ Thus it’s not so much the civilian causalities that worry the Archbishop but the fact that Hamas is getting thoroughly beaten. But the surprise outburst was from the South African Council of Churches (SACC) General Secretary, Eddie Makue, who called on the South African government to take a strong stand against Israel. On further research it turns out that Mr. Makue has just returned from an 11 city US speaking tour denouncing Israeli Apartheid. I was under the impression that the SACC had been seeking to build good relationships with the Jewish community. This is definitely a matter for the Chief Rabbi and the SAJBD to take up. He must understand that South African Jewry will not befriend organizations that seek to harm the Jewish state. Yet despite all this protest, the South African government has not broken off diplomatic ties. In a rather mute statement on Sunday President Kgalema Motlanthe condemned the escalation of violence between the Israelis and the Palestinians, saying it is counterproductive to efforts aimed at bringing about lasting peace and stability in the Middle East. He called on both sides to end hostilities and urged the international community to do make every effort to bring about a two - State solution with an independent Palestinian state co-existing side by side with an Israel State, existing within secure borders as a lasting solution to the ongoing Middle East conflict. Today the South Africa government stepped up its condemnation summoning the Israeli ambassador to express its ‘grave concern’ at ‘the brutal assault’ by the IDF in the Gaza Strip. Deputy foreign minister Fatima Hajaig in a statement said that ‘the South African government called on the Israeli government to stop the military onslaught in Gaza and to immediately and unconditionally withdraw its forces currently amassing on the border’. She also urged all parties to return to peace negotiation immediately without preconditions. As the violence escalates and the bodies pile up, we can expect the anti-Israel rhetoric to only amplify. While of course we need to be concerned about the developing situation on the ground in the Middle East, South African Jewry should also be strategizing about limiting the impact of this latest conflict on the community. A breakdown in diplomatic ties would be a disaster much more for us than for Israel. Despite my past personal objections, I really hope that the SAJBD’s policy a quiet diplomacy with the ANC government pays off this time. One of the most eye opening parts of the seminar I recently attended was the visit to Nitzan which hosts several sites being used to provide temporary housing for the Jewish families forced to leave Gaza. 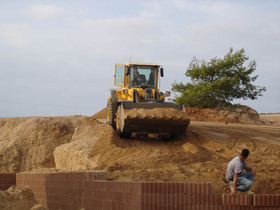 Altogether about 1750 families have vacated Gaza and they need housing, employment, farmland, and community structures. 750 families are living in tiny hotel rooms. 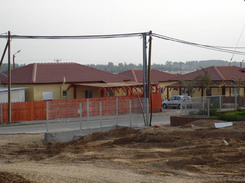 Nitzan will eventually provide temporary housing for 1000 families. I didn’t find out where the other 750 families are supposed to be housed. As of today 500 families are living in Nitzan. Many of the other families from Gaza are living in tents - but that is largely their own decision as a protest against the disengagement from Gaza. Eventually Nitzan will be able to provide temporary housing for 1000 of the 1750 families. Okay, back to Nitzan...the main problem for these people is getting new farmland and employment. Money is scarce. Though they received compensation for the loss of their hothouses, that compensation was only 60% of the total value. I can't emphasise enough just how difficult this has all been for these families. These people are used to being self sustaining. They are not used to being in a position where they have to receive and be needy. They want to be able to do something...to be productive. People there are sad and disillusioned but there is an overwhelming sense of hope that eventually these pioneers will be able to rebuild their lives and start again. Families with 4 or fewer members are getting 60 square meters. Families with more than 4 people are getting 90 square meters. Large families (and most of the families are large) will find it difficult to adjust to these new conditions. In Gaza most of these families had large beautiful homes filled with furniture that cannot now fit into the new homes. The families need to find storage areas for all their old furniture that they can no longer use. At the moment there are no general community structures besides for synagogues. There is no public hall where people can gather and have meetings. Plans are however being made to deal with these problems. Despite all this, the person giving us the tour of Nitzan did emphasise that most people realise that the government is not heartless...they are trying. He also made mention of the thousands of volunteers, young and old that have given up their time to help build the community in Nitzan, asking for nothing in return. All We Have Are Stones!! 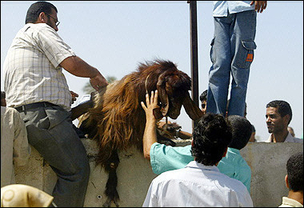 They also have goats, which can now be freely moved across the Rafah border into Egypt. The agreement over the Rafah border crossing between Gaza and Egypt is a massively complicated affair because of the Paris 'customs envelope' agreement of 1994 which provides for a uniform customs and trade envelope that enables the free movement of goods within the territories of Israel and the PA without any customs or other inspections or levies beyond those rendered at the external passages into the entire area. This means that Israel has reasonable concerns about the customs and inspections at all external passages, including those between Gaza and Egypt. First off, a dispatch from Michael Oren, author of one of my favourite Middle East books - the Six Day War. Oren is an Israeli citizen and was recently called up for reserve duty, joining the troops for the Gaza disengagement. Here's a short excerpt, but be sure to read the whole thing, for it is good: A Soldiers Story. Next up on my recommended list, an analysis from the astute Dennis Ross. With all the advice he has been giving on late, you kind of wonder whether he is sending a signal to Bush that he would be happy to again take up the US Envoy mantle: The Roadmap after Gaza. Fourth, the administration must build a bridge to the future. The two sides have very different expectations on what will happen after disengagement: Sharon wants a pause to absorb the emotional trauma and Abbas wants next steps. Each needs an explanation for what is next. The administration should declare that it will take the moribund roadmap and negotiate a common understanding on every Israeli and Palestinian obligation. It won't be easy and will take time. It will take the kind of mediation that the Administration has avoided until now. But Gaza disengagement creates an opening, and it will close for Sharon and Abbas unless the Administration recognizes where we are and what is now necessary. Lastly, I recommend a piece found at JewishWorldReview.com. It's a biting attack on the editorials found in the New York Times. Trying Times. In predictable fashion the Mail & Guardian cartoonist, Zapiro, has joined the crowd of inveterate schemers that have made a mockery of the Israeli withdrawal from Gaza. The warped logic says that Israel's moves are worthless because she has not withdrawn from the West Bank. It takes all the illogic that stems directly from blind hatred to think that Israel should relinquish all her assets before moving to the negotiating table. Israel cannot give up the West Bank without an end of conflict peace deal. When negotiations take place both sides will make compromises in order to extract concessions from the other side. To suggest that Israel should make all of their concessions without getting anything in return from the Palestinians is to confine yourself to the marginalised confines of political discourse. Just like the Business Day cartoonist did. The Mail & Guardian's latest coverage of the Israeli withdrawal from Gaza reflects the level of bias and slant that you should continue to expect from them. Two full pages were devoted to the disengagement, with what the editorial staff would say was perfect balance - analysis by Daoud Kuttab, director of the Institute of Modern Media at Ramallah's Al Quds University; center spread by Chris McGreal (who has previously written that Israeli soldiers deliberately target Palestinian children) headed "Gaza: End of the dream"; and comment by far left-wing London-based Israeli journalist Daphna Baram; and the whole perfectly linked together by the editorial "Gaza: No guarantee" and Zapiro's cartoon again debasing PM Sharon in the most insulting way. Kuttab's analysis compares Palestinian per capita income in Gaza ($700) with that of the Israelis ($16 000) and accuses the US and the Quartet of failing to dictate to Israel how she should work towards fulfilling the Road Map. McGreal says while Sharon has acknowledged the death of his dream of a greater Israel, he has paid lip service to the Road Map and assured the people that "the big (West Bank) settlement blocs ... will remain in Israeli hands". Baram's comments focus on demography and the desire to maintain a Jewish majority in Israel as a liberal rather than a racist aspiration. She mentions too the fact that "new laws make it practically impossible for non-Israeli spouses of Palestinians to become Israeli citizens". No mention however of the fact that the second intifada compelled Israel to enact this temporary law. She also accuses Israel of "ethnically cleansing the Arabs". The editorial acknowledges Israel's move from Gaza as a bold one, but stresses that unless the West Bank and East Jerusalem are also given to the Palestinians, there will be no chance for durable peace or a two-state solution. The editor is incapable of seeing phased moves towards a peace process; rather Israel should just relinquish everything all at once. The editorial goes on "given enough time and resolve, Israel obduracy can be broken throughout the occupied territories ... Sooner or later Israelis will have to confront the reality that a minimum condition for peace is the whole-scale evacuation of the West Bank to create conditions for a viable Palestinian state. The fact is that Israel had no business settling on conquered lands, in defiance of the Geneva Convention." Actually, the Geneva Convention only applies if there had been a sovereign power that was ousted. Prior to 1967 the West Bank and Gaza were occupied by Jordan and Egypt respectively. Only Great Britain and Pakistan recognized Jordan's annexation of the West Bank. There was no sovereign power ruling the land. Israel had every right then to occupy the territory and even settle it until its final disposition is determined by negotiations. Hamas leaders are making maximum propaganda value of their time on earth before Israel sentences them to join Yassin and Rantisi. Hamas leader Khaled Mashaal, operating openly in Beirut and Damascus, said that the Israeli withdrawal marks the beginning of the end of the Zionist dream. Israeli withdrawal from Gaza signifies the collapse of the Zionist outlook and is "a sign of the final battle that will decide the conflict." "It is a defeat for Israel, which did not find an answer to the Kassam rockets or the war of the tunnels or to suicide attacks." Zahar expressed confidence that the disengagement will lift the morale of the Arab and Islamic world and will affect the battle for Afghanistan and Iraq. "We are part of the great world plan whose name is the world Islamic movement." "We do not recognize the State of Israel nor its right to control any of the land of Palestine." "Palestine is holy Islamic land that belongs to Muslims the world over," he emphasized. We will transfer two-thirds of our budget to the West Bank," he said. "Our rockets have a range of 18 kilometers. 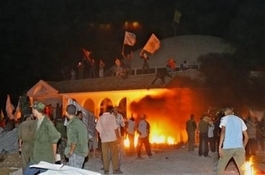 This means that if we fire them from Kalkilya, they will hit the occupied city of Tal al-Rabi [Tel Aviv]." The Hamas rhetoric is nothing new. They are always planning new attacks regardless of what Israel does. The Palestinians are losing a powerful weapon. 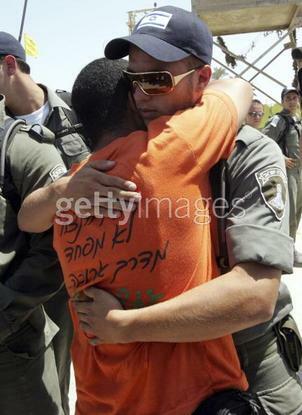 The value of peace has always determined Israeli strategies. This has played straight into the hands of the terror gangs who realise that a negotiated peace settlement will end their dreams of destroying Israel. The value drivers behind the disengagement were 'Jewish majority', 'democratic', and 'secure'. Israel placed the idea of 'Israel at peace' at the bottom of their value list. This is not because they don't view peace as important. On the contrary, they realise that peace is hopelessly unattainable at this stage. The crowning importance of peace to Israel turned the ability of the Palestinians to deny it into their ultimate weapon. By taking a unilateral approach Israel has deprived the Palestinians of this weapon. And Hamas know it.